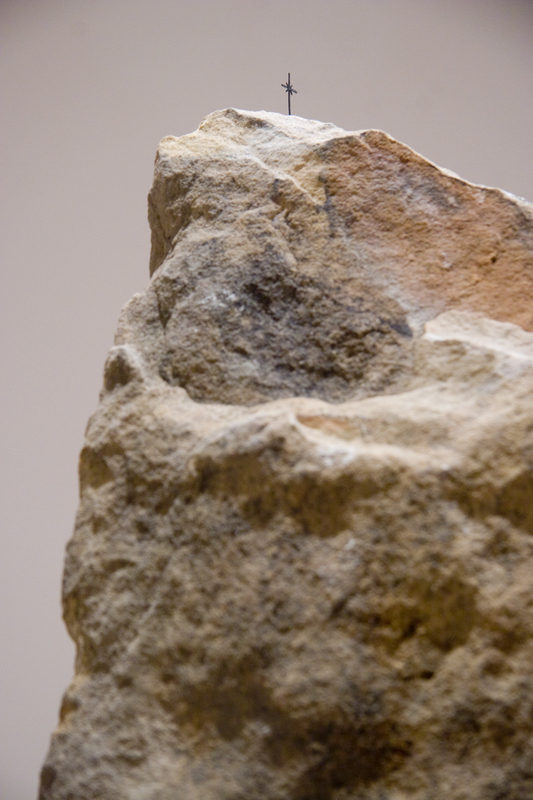 Standing on top of each of the large megalith-like boulders that comprise Summits (2009), Kris Martin’s eight-part found rock installation, is a small marker. When, and if, spotted, these identifiers change the viewer’s perspective and turn the room’s vaguely prehistoric ambiance into less numinous territory. A small paper cross crowning each peak indicates that they have all been conquered, and by using a charged symbol whose real-life application connotes a range of meanings – of man conquering the limits of awe-inspiring nature, of a civilisation conquering another civilisation, of death conquering all – Martin sets in motion a stark thinking process. Martin’s conceptual installation, repeating the same conceit eight times over, is a comment both on the futility of human ambition – what is left once seemingly unreachable summits have been conquered? – and also on the oppressive and absurd spread of consensual, hegemonic belief.